There are a group of super useful and polite words that everyone should learn before visiting Japan. One of those first words, or phrases that you should learn is you’re welcome in Japanese. This allows you to acknowledge other people any time that they express their heartfelt gratitude towards you for any reason. Think about the same situation in English. When you tell someone “thank you” what sort of responses do you enjoy hearing back from the other person? These responses are much nicer to receive than a mere grunt or silence. So let’s hop in and learn some new phrases! Hopefully everyone who is learning Japanese has a good beginner book or a useful phrasebook that they can use and reference for the basics. If you do, then you will no doubt see this word as the Japanese translation of you’re welcome. This is a pretty long word, and it might be a little hard to say it at first, so I would recommend that you start by saying it in parts. But instead of starting at the beginning of the word, which is what most people do, I would actually recommend that you start and the end and work backwards! This is a technique that the Pimsleur courses use, and I have found it to be incredibly effective for learning the pronunciation of hard words. Here’s how I would break it down. Say each one five times before moving on to the next. It also helps a lot to listen to a native say the phrase and then combine that audio with your practice of the new word. When it comes to reading this word in Japanese, it is most common to see it written all in hiragana like I’ve shown above, but as it turns out there are actually some kanji that can be used with it. Here is the same phrase, but written in kanji. I wanted to include this in case you ever see it in print. 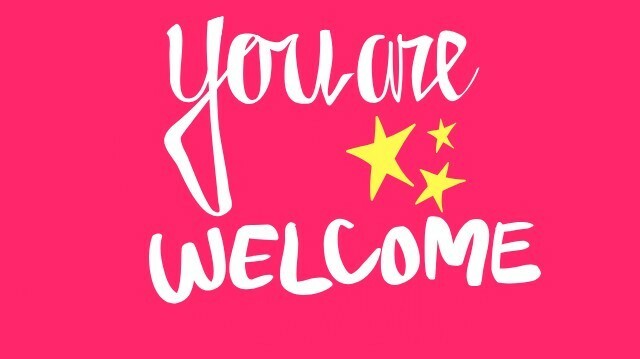 So now you have the basic phrase for you’re welcome down, and if you only learned this one, then you will still be able to communicate nicely with other people any time they say thank you in Japanese. But there are some other ways that are beneficial to learn so that you can switch things up every now and again, and understand them when people say them to you. Let’s see them now! You know how in English, we will do a small favor for the other person and they will be really appreciative of us and say things like “thank you so much” and we feel like, “no, no it’s not a problem at all”? Well you say pretty much the same thing by repeating the Japanese word for no twice and shaking your head. No, no, you’re very welcome! So if you’re feeling adventurous, try giving this combo phrase a go! Of course, there are a lot of different responses you can use in English besides just a basic YW, and it is the same way in Japanese as well. If you watch a lot of anime or J-Dramas, then you will probably pick up a lot of them from just watching the interaction. Here is one that you may have heard before. It can also be used as an expression to say things like “Absolutely not!” or “That’s preposterous!” in a way that displays a lot of strong emotion. Here’s the point I’m trying to make, とんでも無い has many uses. But as long as you use it in situations where you could also say どういたしまして, then you should be fine. Related: Learn how to say “No problem!” in Japanese. There is also a slightly more formal way to use this phrase, and it is formed by using ありません (arimasen) in place of 無い (nai). It means the same thing, so feel free to use it instead. This last word is also one that can be used in several different situations. In fact, one of those situations actually is to say please! The word is どうぞ (dōzo) and when you are in situations where you’ve helped someone do something, such as carry their luggage into the house, and they thank you for your assistance you can use this next phrase. The word いつでも means “at all times” and by combining it with どうぞ in this way, it’s like telling the other person “Yeah, sure! Anytime!” instead of the normal “You’re welcome” sort of thing. I’m sure that there are additional ways you could say you are welcome in Japanese, but these five ought to get you started. If you’ve ever come across one that’s not in this article, let me know by leaving a comment below! I was just reading your other awesome post and landed on this one as well! As i mentioned in my other comment I’m really research to prepare myself for a big meeting with an important business prospect from Japan. I do have a question. When meeting someone for the first time is it more appropriate to say things the formal way starting out or is informal sociably acceptable in Japanese culture? I want to make sure I put my best foot forward. It’s probably best to err on the side of being too formal, especially when meeting someone new and when you’re in business dealings. That being said, as a non-Japanese person you’re not really expected to know all the intricacies of the culture and language. But that just means you’ll make an even better first impression! Wow, learning Japanese sure is difficult. I don’t think I will ever be able to write it, but I do hope to speak it. My husband wants to go to Japan so badly, and so he has been learning different Japanese phrases. I was originally going to just let him do the talking, but it’s been kind of fun learning together, so I’m diving in as well. Your site is absolutely wonderful, and I am thankful for it. Great site! Hey, it is my pleasure to help! Yeah, learning how to read and write Japanese is a pretty big task that takes a lot of time and energy. It is a lot quicker to learn how to speak with some phrases and common Japanese words. I would definitively recommend a focused approach on verbal communication if you’re planning on going over to Japan within the next year or so. That way you can really connect with the locals when you visit!